Milanese Saffron Risotto | Pasta & Co. Pasta, Risotto, Gnocchi + Co.
Risotto alla Milanese is most likely the most famous dish of the Lombard and Milanese tradition, together with the Panettone. Kids (and grown-ups) call it “the yellow risotto” (It. 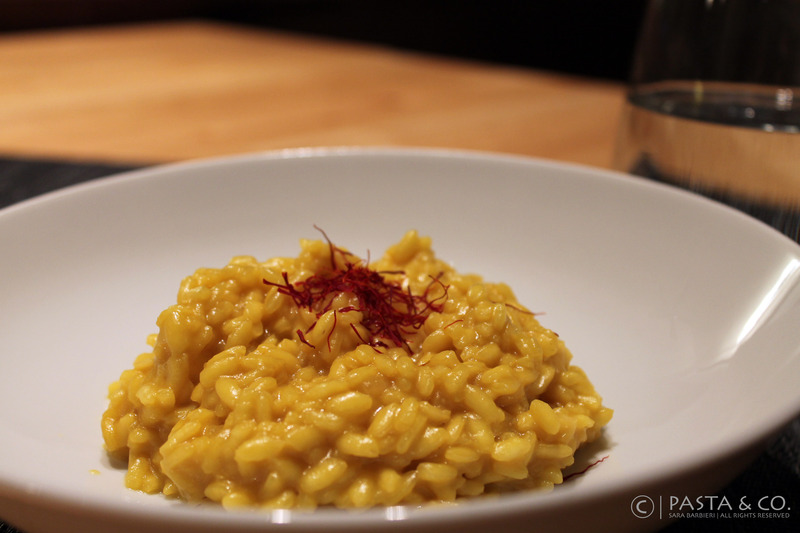 “risotto giallo“) for the yellowy color given by aromatic saffron, which is the world’s most expensive spice. This risotto is widely used as side dish for ossobuco, but it’s also ridiculously AWESOME with mushrooms, sausages and shrimps. The original recipe for Risotto alla Milanese calls beef bone-marrow to be sautéed together with butter and onion. You will see it mentioned, but I don’t use it. 1) First thing you wanna do is prepare the vegetable stock. Chop the onion, the carrot, the stems of celery and the potato and add a half cube of vegetable bouillon. Throw everything into a saucepan and add 4½ cups of water. Cook it for 15-20 minutes until fork tender. Or: use a packaged organic veggie broth – if it comes salted, be sure you taste risotto before adding more salt. 2) Next, chop up the shallot finely. Pour 2 tbsp. of butter in a saucepan; add the chopped shallot (and beef bone-marrow) and sauté over medium-high heat. 3) Add the rice, stirring to coat with melted butter. When the rice has turned a golden color, pour in 1/2 a glass of white wine, stirring constantly. Once the wine is fully absorbed, add half a cup of the broth and stir until it is absorbed. Continue adding it, half a cup at a time, stirring continuously, until all liquid is absorbed. 4) After 10 minutes of cooking, dissolve the saffron in 1/4 cup of hot broth and pour it into the risotto. Continue to stir and finish cooking the risotto. Rice will be ‘al dente’ (tender yet firm to the bite) in about 15-20 min. 5) A few seconds before removing from heat, blend in a teaspoon of butter and a handful of Grana Padano and let it rest a couple of minutes. 6) Remove from heat, adjust with salt to taste and serve with some freshly chopped parsley or if you have any, red saffron pistils! What do you wanna cook today? Purple Basil? Let’s Make An Amazing Pesto! Hello! My name is Sara. My soul (and palate) is a flavorful mix of Mediterranean traditions. I love food, wine, photography and good stories. I cook and photograph food in sunny Houston, Texas.